The desserts on my fake-Thanksgiving table were a bit more colorful than the usual shades of orange and um...pecan that usually fill the holiday table. But as someone who has little interest in pumpkin pie or corn syrup pie (which, let's face it, is actually what pecan pie is), I decided to try a few new things for my menu. I went to the market with vague ideas and a desire to let the seasonal produce inspire me. It was a the towering display of plump, in-season kiwis that first got me excited. I grabbed a handful and held them up to Eugene. "Did you know that it's kiwi season now? I'm going to make kiwi sorbet for the party." Kiwi, like citrus, is a winter fruit that's often mistakenly appropriated for summer. But mid-to-late November is really when the gorgeous green fruits start to come into their own. Usually eaten raw, a sorbet is a simple way to highlight the natural flavor of the in-season fruit while still making it exciting enough to serve at the end of a festive meal. When I was making this, I casually tossed a whole vanilla bean and a few star anise pods into the simple syrup as it cooled. It infused the syrup with just a hint of flavor that really played quite nicely with the natural honey-like flavor of the kiwi fruit. Sorbet is a simple frozen treat to make. 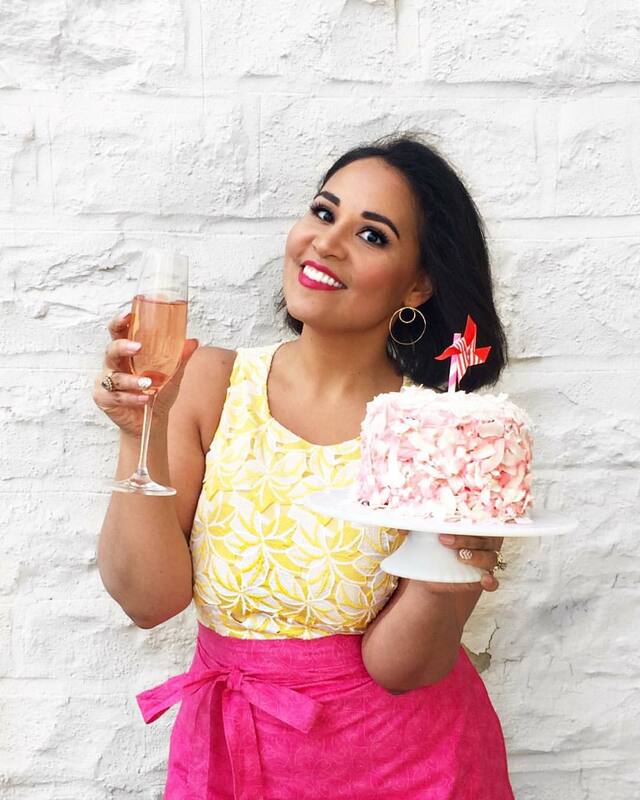 Though I recommend using an ice cream maker for sorbet, there are ways of doing it without one and I recommend Anna's tutorial for advice. At home, I use a small ice cream maker that my brother gave me for Christmas a few years ago, and which can easily be purchased online very inexpensively (I've seen it for less than 30 dollars at times) or possibly even on Craigslist. These machines are wonderfully versatile and don't take up that much space (even in my tiny kitchen) so if you're interested, keep an eye out for a good deal. 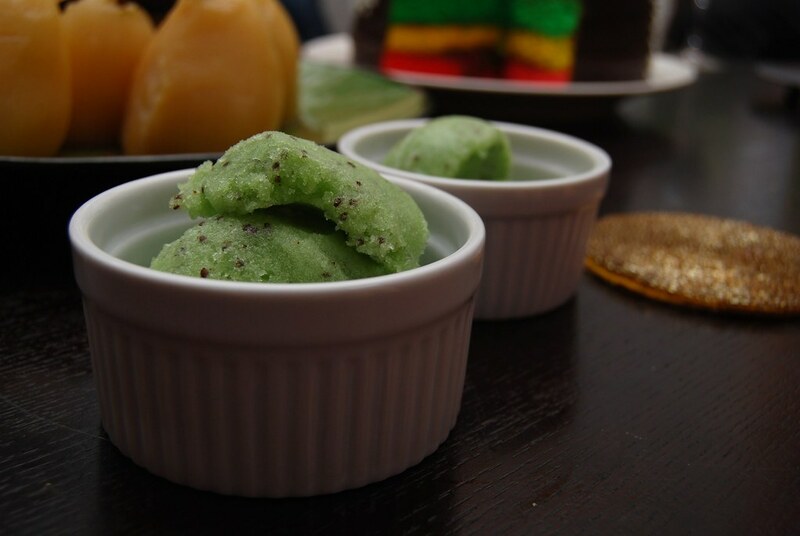 I served this sorbet along with white wine and anise poached pears, a rich chocolate ganache sauce, and my Italian Rainbow Cookie Cake. The sorbet is particularly lovely when drizzled with the chocolate sauce. Kiwi, I've discovered, is wonderful when paired with bittersweet chocolate. At my party, a few of the guests noted that I must have gone to a lot of trouble to prepare the sorbet since I had to peel all those kiwis. I told them about the great "spoon trick" I use to peel the kiwi, which cuts the time down to a few seconds per fruit. I decided to film a quick video to show you all how simple it really is. If you plan to make this recipe, I definitely suggest checking it out first as it will save a lot of time. 1. Sugar and alcohol are what keep the sorbet soft and scoop-able. You can skip the alcohol in this recipe, but note that the sorbet will probably freeze a bit harder so you'll have to remove it from the freezer 10 minutes or so before serving. 2. The sweetness of the sorbet mix will be much weaker once you freeze it. It's good to keep this in mind when testing the recipe. You want it to be a little sweeter than your final product so don't be too scared about adding sugar. Of course, do keep the natural sweetness of the fruit in mind when preparing the recipe. You can also add a hint of honey, or more lemon juice to balance the flavor. Hints of vanilla, rum, and star anise help to highlight the wonderful natural flavor of the kiwi. In a medium size saucepan, combine the water and sugar, and bring to a boil until all the sugar is dissolved. Lower the heat and let simmer for 2-4 minutes or until the water reduces slightly. Turn off the heat and add the anise pods and vanilla bean, cover and let cool to room temperature. Once cool, remove the anise pods and vanilla bean and reserve the syrup. 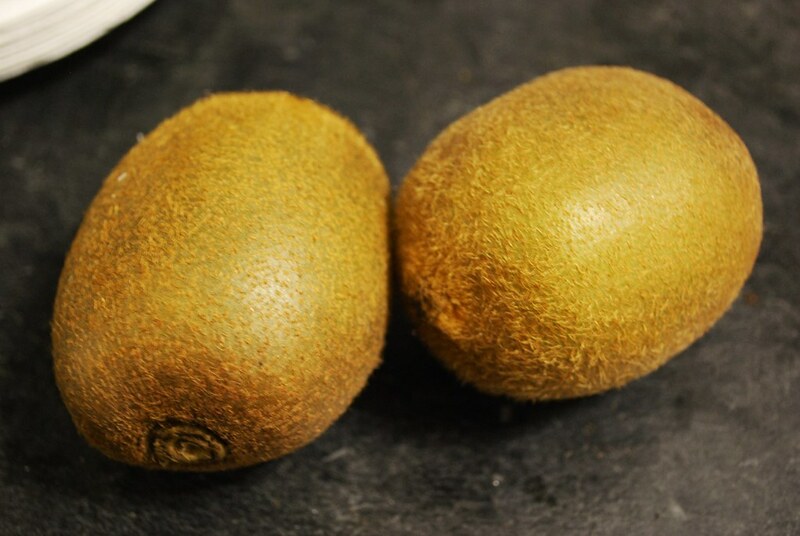 Peel the kiwis and cut each one in half. (Check out my tutorial on How to Peel a Kiwi for a great trick to do this quickly.) Use a blender or food processor to puree the fruit until smooth. Combine the kiwi puree with the cooled syrup, rum, and lemon juice. Pour into your ice cream maker and freeze according to the manufacturer's instructions. 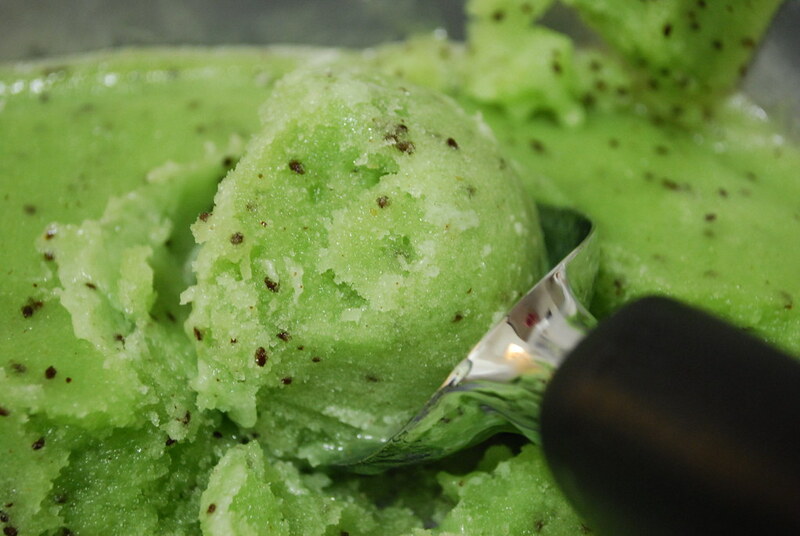 Pour the frozen sorbet into an air-tight container and store in the freezer for up to 2 weeks. Your blog is absolutely delightful... wow!! So many wonderful pictures and recipes... you are wonderful!